This is the wedding of Rachel and Max. We helped them out with their wedding on August 31st. Here are some beautiful photos by Susan Jackson Photography. The cuddly bride and groom. 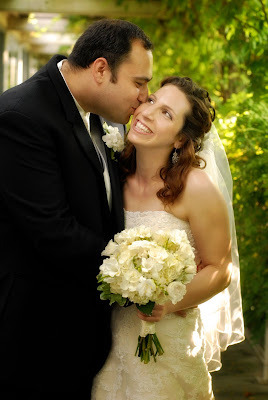 Rachel carried a bouquet of white hydrangea, white freesia, and ivory spray roses. 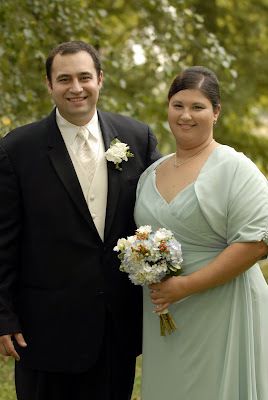 The groom wore a white freesia with hydrangea accent. The bridesmaids carried blue hydrangea, pink berries, and white freesia. 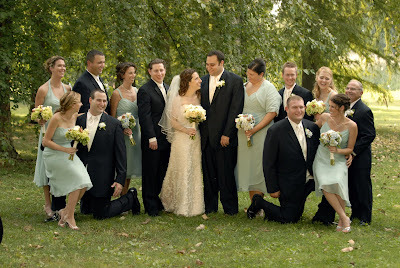 Alternating bridesmaids had green hydrangea in their bouquets, instead of blue. 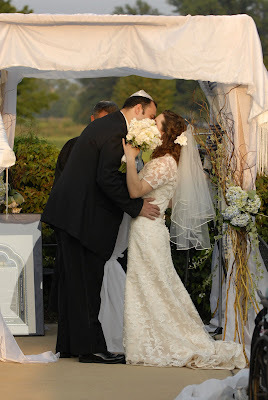 We decorated our chuppah with fabric and clusters of blue hydrangea, ivy, and curly willow for the outdoor ceremony at Forest Park Golf Club. The same flowers, textures, and colors were carried through to the reception using the bride’s ceramic urns for the guest tables to give a lush, gardeny feel. Thanks to Rachel, Max and their families for being great clients! !